A detailed inventory of plant and machinery that will be removed from the property upon completion, is available from the selling agents upon request. 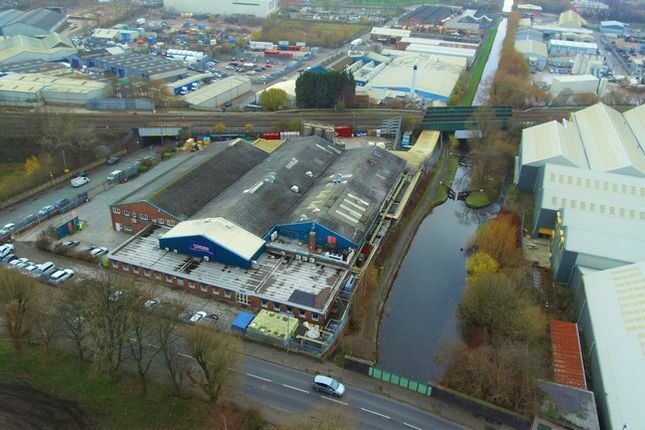 The surrounding area is currently the subject of significant inward investment and development and the site may lend itself to alternative uses, subject to the receipt of the relevant statutory consents. The site is understood to benefit from planning consent for commercial uses falling within Use Class B of The Town and Country Use Classes Order 1987. Site A - Offers are invited in the region of £1,600,000 exclusive. Site B - Offers are invited in the region of £2,200,000 exclusive. Total site - Offers are invited in the region of £3,800,000 exclusive. The property comprises of a commercial complex sitting on a Total Site of approximately 4.29 acres (1.736 hectares), which is only offered for sale due to the relocation of the existing business by Princes Limited. The property provides accommodation with a Total Gross Internal Floor Area of approximately 108,111 ft sq (10,043.8 m sq) arranged over two sites that are currently linked by way of a tunnel arrangement that runs under the railway line and which dissects the two sites, defined in these particulars as Site A and Site B. Site A as shown edged red on the plans that are included within these particulars is situated at the junction of Lord North Street with Grimshaw Lane. It provides a Total Site Area of approximately 1.97 acres(0.797 hectares). The site provides accommodation with a Total Gross Internal Floor Area of approximately 45,469 ft sq (4,224.2 m sq). The accommodation provides a variety of office and warehouse/workshop accommodation. To the elevation of the site, which fronts onto Grimshaw Lane on the North East side of the site, there is office accommodation with a rear warehouse/workshop accommodation attached. The warehouse has eaves heights ranging from 3.6 metres to 5.4 metres. The buildings benefit from a variety of dock levellers providing access to the commercial part of the premises. There is also a first floor section to the property structure which is currently arranged to provide a canteen and store. Access to the site is from Lord North Street with the access to the external areas that are used for car parking and circulation. Site B as shown edged blue on the plans that are included within these particulars is located at fronting onto Lord North Street. It provides a Total Site Area of approximately 2.32 acres (0.94 hectares). The site provides accommodation with a Total Gross Internal Floor Area of approximately 62,642 ft sq (5,819.6 m sq). The accommodation provides a variety of warehouse/workshop accommodation with an eaves height ranging from 3.624 metres to 6.45 metres. There are a variety of dock levellers and the access to the site leads to external areas used for car parking and circulation. Access to the site is via two access points from Lord North Street with these providing access to external areas used for circulation. Within the site there are a variety of outbuildings. The property is prominently located at the junction of Lord North Street and Grimshaw Lane in the area of Greater Manchester known as Newton Heath. Newton Heath is an established commercial area located approximately 2.8 miles north east of Manchester City Centre with a population of 9,883 at the 2011 census. Newtown Heath forms part of the Metropolitan County of Greater Manchester. Newton Heath is the subject of a significant degree of regeneration and is at the forefront of Manchester’s New Media Industry following the development of the Sharp Project off Oldham Road. The surrounding commercial occupiers include Johnson and Johnson and Manchester Council’s Works Depot. The property abuts the Rochdale Canal to the northern boundary of the site and the property is located within easy access of the A62 that provides access to the M60. Newton Heath is located approximately 3.5 miles south of the M60(The Orbital Motorway serving Greater Manchester), which provides access to the National Road network. The area is approximately 1 mile north of the Etihad an area that is under considerable regeneration. The Metropolitan County of Manchester of which the property forms part is the main City serving the North West and had a population of 2,798,800 as at the 2017 mid year estimate. The City benefits from Manchester Airport, which is the third busiest airport in the United Kingdom and also benefits from a Metrolink serving the town centre. Manchester is a well established important commercial centre in the north west. It is understood that the property is elected for VAT. All figures in these particulars are quoted exclusive of VAT. Property descriptions and related information displayed on this page, with the exclusion of Running Costs data, are marketing materials provided by Halls Holding Ltd, and do not constitute property particulars. Please contact Halls Holding Ltd for full details and further information. The Running Costs data displayed on this page are provided by PrimeLocation to give an indication of potential running costs based on various data sources. PrimeLocation does not warrant or accept any responsibility for the accuracy or completeness of the property descriptions, related information or Running Costs data provided here.